Empire Contractors provides full-scale roof restoration services to residents, property managers, and business owners in and near Muskegon, Michigan. Our premium roof coating systems are a great alternative to total roof replacement, allowing you to add years to your tired, old roof’s life while saving time and money. If you are interested in restoring your current commercial building roof to a new, worry-free system, give the experts at Empire Contractors a call today at (231) 861-7221. One of our friendly team members will be happy to schedule an initial consultation or answer you questions about the many benefits roof coatings offer. Roof coatings quickly take care of the issues that inevitably come about as your roofing system ages. The list of benefits that come with roof restoration is extensive, and we invite any commercial building owner or manager to find out how a roof coating from Empire Contractors performs in real-world conditions. Lower utility bills – Reflective coatings drop roof top temperatures by as much as 80 degrees. Less wear and tear on HVAC equipment – Coatings reflect up to 85% of the suns rays, reducing the stress on equipment. Financial incentives – Empire Contractor’s roof coatings are ENERGY STAR rated, qualifying our customers for tax rebates. 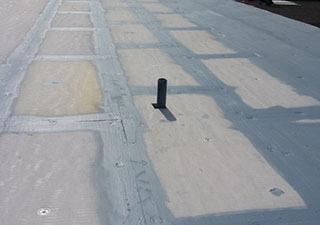 Waterproofing – Seamless, monolithic, elastomeric roof coatings fill every crack and seam to give you a leak-free roof. Low maintenance – Requires a cleaning about once a year. Easy to install – Lower labor and material costs than a roof replacement. No landfill or disposal fees. Can be installed with minimal disruption and without closing down business. We Only Use Premium Roof Coating Products! Empire Contractors knows that our work is only as good as the materials we use to complete it. 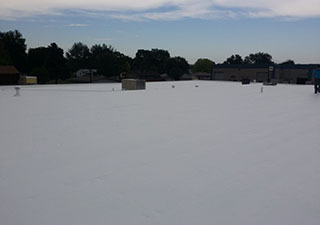 For that reason, we use elastomeric, fluid-applied roof coatings from Conklin. For more than 40 years, Conklin has been formulating and manufacturing premium roof coatings that have stood the test of time. Optional, non-prorated warranties of up to 20 years. Just two coatings can extend your roof’s life by up to 36 years. Flexible properties allow your roof coating to expand and contract as temperatures fluctuate. Before you take the plunge on an expensive, messy roof replacement, give Empire Contractors a call at (231) 861-7221. Don’t throw your money away with a roof tear-off and new installation – give roof restoration with our premium roof coatings a try!